Bish Iwaszko was a leading light of the London Wargames Section, and a military modeller of similar standing to John Sandars.In 1979 he made a range of metal figures available through his firm Miltra - Military Training Aids. The company is still in existence, providing among other things replica ordnance and 1/12 scale bridging equipment for military training, although the figure range has changed hands a number of times. The figures were originally designed for museum use, by Jack Alexander of Jacklex fame. The figures were unusual in a number of ways; they tended to be in casual (standing around) poses rather than combat ones - this reflected their original purpose as museum diorama accessories; they often had separate weapons; and represented some subjects which at the time were impossible to obtain elsewhere, like Polish 1939 and French and Belgian 1940 troops. They differed from their contemporaries in another way, being 1/72nd scale. There were some exotic figures, including Polish cavalry, and some even more exotic equipment, such as a TKS tankette and more gloriously a Cavalry Taczanka with 3 horses, 3 crew, and a Browning MG.
BW Models took on the range from Miltra, and later they passed on to Trux. I am not sure whether these figures are currently available and if so from where - any information on this would be gratefully received. The listings I have used have been taken from a Trux catalogue, I think from the 90s. 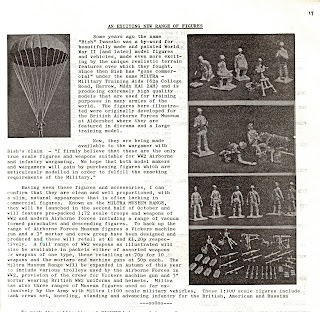 The review from Wargamer's Newsletter of the original release (British Airborne Forces) is reproduced below. I am also posting a series of articles by Bish Iwasko from Miniature Warfare, called Invasion WW11, over on Vintage Wargaming. These are profusely illustrated with photos of interesting models. According to the Trux website (http://truxmodels.co.uk/index.html) they ceased production in 2005 - there's no indication of who has the moulds now sadly. I remember the regular Miltra ads in Mil Mod - i wish i'd bought some (well, loads actually) of the figures then - recently i've been looking at the available ranges of metal 20mm WW2 figs and can't find many that i like. Typical..
my folk memory of Miltra is that they were the first of the anatomically accurate ranges, and very expensive. We had some Miltra vehicles as recognition when I was TA Int Corps in the '70's.